For courses in First-Year Composition – Rhetoric. 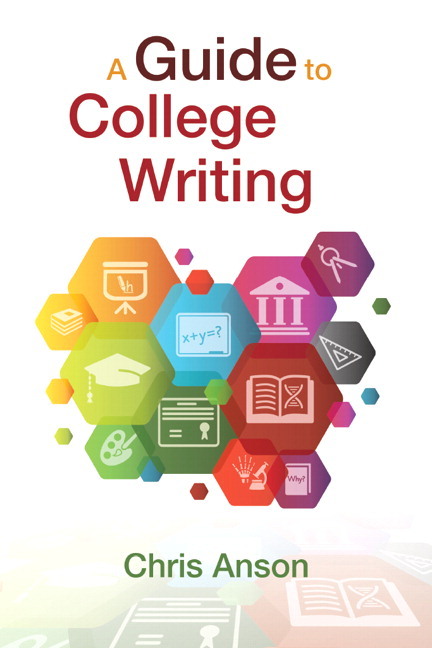 A Guide to College Writing is both an excellent introduction to college writing for composition courses that emphasize writing across the curriculum (WAC) and a writing guide for use in any college course. Scholar and former CWPA president Chris Anson brings his research on and knowledge of WAC, threshold concepts, and transference to this first-year writing text. Anson offers a refreshing new choice to faculty seeking support in teaching the features and forms of other disciplines. The text does not teach any one form, but rather how to observe, analyze, and reproduce the forms and intellectual strategies of whatever the students might be asked to read and write. 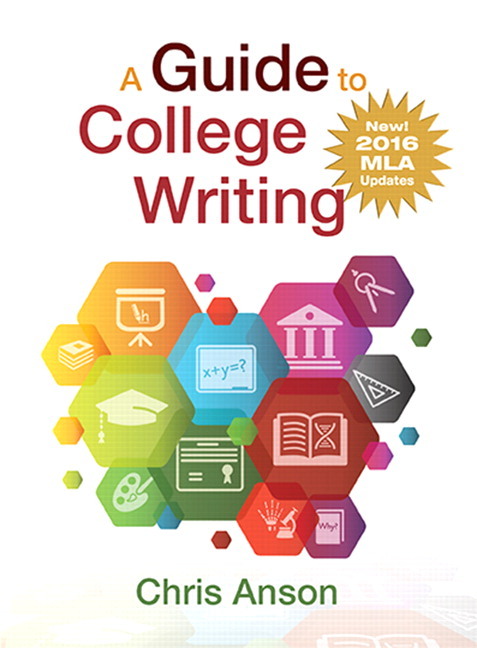 Students are walked through the writing process, beginning with shorter, lower-stakes “microtheme” assignments and scaffolding toward longer, sustained formal projects typical of their discipline. Throughout, students learn how to use writing as a learning tool. Pearson Writer is a revolutionary digital tool for writers at all levels. Built for mobile devices, it streamlines the tedious and time-consuming aspects of writing, so that students can focus on developing their ideas. Pearson Writer makes it easy to stay organized, track tasks, and stay on top of writing projects. Students can set milestones prior to the due date, manage their sources, organize their notes visually in the Notebook, and even get automatic feedback on their prose. Pearson Writer is now available with Noteclipper, which allows students to save online sources quickly and easily. Students, if interested in purchasing this title with Pearson Writer, ask your instructor for the correct package ISBN and Course ID. Instructors, contact your Pearson representative for more information. Short, one-draft "microtheme" assignments are designed to enhance reading and critical thinking. Students are walked through the process of putting together higher-stakes, formal assignments and projects from start to finish, including an entire chapter on drafting and revising. Conducting primary or secondary research is explored in detail, including source work and the integration of outside material into a research project, along with conducting an "anatomy" of texts in order to understand how particular forms of writing work across a diverse range of contexts. Frequent outtakes provide "key concepts" that help students to write in different disciplines, and periodic writing activities bolster their understanding of the textbook material. Abundant examples throughout show how writing may vary across the disciplines in terms of genre, organization, and style. In the final chapter, “The Comparative Anatomy of Texts,” students observe and analyze for themselves the distinctive characteristics of any text type — whether a movie review, a lab report in a heat-transfer course, a mathematical proof, a report of a social-psychological experiment, or a paper in public history — in order to present their own discoveries in the language and forms of the intellectual community of practice that the discipline represents. What Is Writing to Learn? What’s the Purpose or Goal? What’s the Level of Formality? What Changes with Larger and Higher-Stakes Projects? What’s Transfer, and Why Practice It? What Does Revision Really Mean? Chris Anson is Distinguished University Professor and Director of the Campus Writing and Speaking Program at North Carolina State University, where he teaches graduate and undergraduate courses in language, composition, and literacy and works with faculty across the curriculum to reform undergraduate education in the areas of writing and speaking. Before moving to NCSU in 1999, he spent fifteen years at the University of Minnesota, where he directed the Program in Composition from 1988-96 and was Professor of English and Morse-Alumni Distinguished Teaching Professor. He received his Ph.D. and second M.A. in English with a specialization in composition studies from Indiana University, and his B.A. and first M.A. in English from Syracuse University. Chris has received numerous awards, including the North Carolina State University Alumni Association Distinguished Graduate Professor Award, the State of Minnesota Higher Education Teaching Excellence Award, the Morse-Alumni Award for Outstanding Contributions to Undergraduate Education, and the Governor's Star Service Award for his service-learning work at Minnesota. He was an NCTE Promising Researcher Award Finalist and has received or participated as a co-principal investigator in over $1.8 million in grants. An avid writer, Chris has published 15 books and over 110 journal articles and book chapters and is on the editorial or reader's boards of ten journals, including College Composition and Communication, College English, Research in the Teaching of English, Across the Disciplines, Written Communication, Assessing Writing, and The Journal of Writing Assessment. He is currently working on research exploring the effect of teachers' oral screencast responses on students' understanding and improvement of their writing. Chris has given over 550 conference papers, keynote addresses, and invited lectures and faculty workshops across the U.S. and in 29 other countries. Chris has served as Chair of the Conference on College Composition and Communication (2011-14; Chair, 2013) and as President of the Council of Writing Program Administrators (2002-2005) and spent seven additional years on the WPA Executive Board. He has also served on the CCCC Executive Committee (1993-96 and 2011-14) and 11 other CCCC committees, as well as several NCTE committees. He chaired the NCTE Assembly for Research in 1992-3 and was program co-chair of the NCTE Global Conference on Language and Literacy in Utrecht, Netherlands. He chaired the WPA Task Force on Plagiarism and the WPA Task Force on Internationalization, and formed the MMLA's Writing-Across-the-Curriculum section.